OPOWER aims to get people to use less energy by providing them with interesting reports about their own energy usage. The company promotes energy efficiency with "persuasive technology"
Yates: "The nice thing about efficiency is that it's bipartisan"
(CNN) -- An electric bill usually isn't much to smile at. But slapping smiley faces on the bills of people who use less energy than their neighbors is pretty much OPOWER's business. The Virginia-based software company crunches data from smart meters and energy-usage histories to give people power bills that are packed with information -- including a chart of how their personal energy usage compares with that of neighbors with similar-sized homes. This injects a little competition into the monthly bill cycle. If someone sees their neighbors are able to save money by using less energy, then they might try to turn the thermostat down or turn off some lights to compete. OPOWER also gives people advice based on their living conditions and the reason their bill is so high. A renter losing money on heating might get a tip about putting insulation or tape around windows. 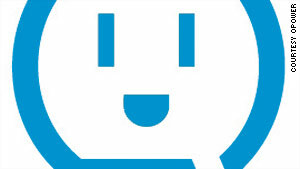 OPOWER's friendly logo is meant to encourage people to use less energy -- and save money. And, of course, the energy-frugal get bills with a smiley face on them as a reward for their environmental stewardship. So far, OPOWER, which was founded in 2007, has 45 utilities as customers. It reaches the homes of 2 million Americans, many of whom get some level of service without having a smart meter installed. But it's expanding fast. This week, OPOWER announced a $50 million investment from Silicon Valley. The energy savings produced by the software could be significant. Dan Yates, the company's CEO, says the average OPOWER customer cuts 2% to 3% of his or her energy usage because of this snappily presented information. If the service expanded to the entire country, the energy savings would be the equivalent of removing 3 million American homes from the power grid, he said. CNN: Give me the elevator pitch for what OPOWER is. How do you describe it to people? Yates: OPOWER is a consumer energy efficiency software company. We work with utilities to give end customers -- everyone who rents or owns a home -- much better information about their energy use. And we do it so as to help utilities help their customers really save energy. That's important because it's a big part of the utility business now -- achieving energy efficiency goals. CNN: If I'm a person who's using this software, what do I get out of it? What do I see? Yates: For customers that have utilities that use smart meters, we have a text and e-mail alerting platform that will warn people if they're on track for a high bill. We send reports home in the mail to give you analysis and insight into your energy use and how you can save energy. So across all of these channels, you'll see things like how your energy use this month or this week or this year is comparing to similar-sized homes in your neighborhood. With utilities that have smart meters, we can help you get a more sophisticated breakdown. 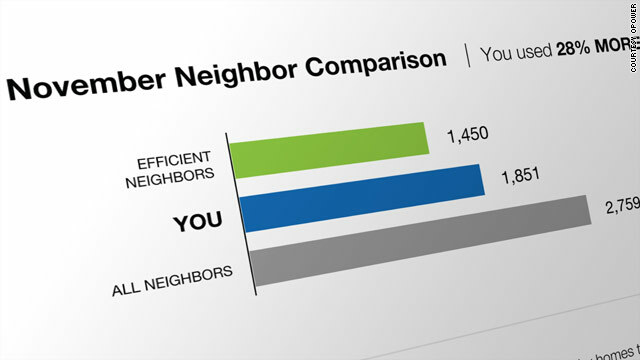 If you're using more energy than your neighbors, is that coming from air conditioning usage? Or your heating usage? Or your base load, which is things like refrigerators and freezers? We then give folks very targeted recommendations based upon that analysis. Instead of 30 generic tips, we're showing you three recommendations that are specifically targeted to your situation. CNN: Do you have evidence that this works -- that people are able to take this information and reduce their energy usage? Yates: That's the killer thing about what we do. We drive on average between a 2 and 3% reduction across, now, millions of homes. It's conclusive that people, when they get this information, actually can and do reduce their energy use. In fact, a lot of the things people do are no-cost solutions. So when somebody realizes they have a major spike in air conditioner use, the easiest thing to do is raise your thermostat 2 degrees, and you'll save 10% on your air conditioning bill. People also get more fastidious about turning out the lights and all the other things we know we should be doing. CNN: Is the idea to guilt people into changing? Yates: To be clear, we're showing folks how they compare to an average of similar-sized homes in their neighborhood. We don't show anybody an individual neighbor's usage, because we're always respecting people's privacy. But we're giving you an accurate benchmark. The term for this neighbor comparison thing in behavioral psychology is actually "peer proof." Because it's not actually guilt, and it's not peer pressure -- where we think our minds go immediately. It's just showing people their energy usage in a context that makes the most sense to them. It's in effect showing you the part of your energy use that's most addressable for savings. To illustrate this, let's say you get a $180 bill on average in the summer. Is that a high bill? I don't know. How big is your house? How hot is the area? We weren't born knowing if $180 a month is a high bill in the summer. But now if you get a bill that is $180 a month, and you find out that the average of similar-sized homes right in your neighborhood -- your street and the surrounding streets -- is $120 a month, all of a sudden you have both a strong emotional sense and a legitimate rational reaction that there's a $60 dollar addressable savings opportunity. It has nothing to do with guilt or pressure, it just has to do with putting information in a context that gives you confidence that there's something you could do that wouldn't compromise your lifestyle unreasonably and would save you $60 a month. CNN: What's up with the smiley face? Yates: The smiley face is part of our brand -- it's in our logo as sort of a reflection of the fact that it's in our reports and in our websites. It's another element of the behavioral psychology background that we come from. It's important that when people are told they're using less [electricity] than average, that they're rewarded for that and reminded that that's a good thing. We don't want people to think that using less is in fact an opportunity to start using more. We give positive reinforcement whenever we can, and we give it in the simplest and most universally understandable way because we're just trying to be clear and unambiguous about it. And at this point it's become cute -- so we're fond of it. CNN: Tell me about how you started this company. I read this idea originated from a trip you took? Yates: I grew up camping and backpacking and liking the woods, but I'm not the guy who knows the horned owl from the spotted owl, etc. And I took this long trip with my girlfriend at the time -- now my wife -- and we drove the whole Pan-American (Highway) from Alaska all the way to Patagonia, in about a year. Coming out on the other side, I just really felt like I had seen personally how degraded the environment is everywhere. I had a visceral sense of it in a way that I didn't have prior to the trip. I came back really certain that I wanted the next thing I did to be focused on the environment. That's what the trip gave me. The actual idea of coming up with this energy efficiency information service idea was a longer evolution. We realized there's a billion and a half utility bills going out a year in the U.S. And we just had this basic naive thought of, "Wouldn't it be better if they were a lot more informative about energy usage?" It's just a huge space that's not being utilized. CNN: It seems like there's a lot of emphasis put on alternative energy technologies, but do you think the way to save energy is just to promote using less of it? Yates: We need all of it. We need to drive efficiency. McKinsey conducted a very robust study identifying that the U.S. can drive 50% of U.S. energy usage out of efficiency. But that leaves the other half, which we need to be accomplishing through all types of renewable energy sources if we're going to get to a very low or zero-emissions future. The nice thing about efficiency is that it's bipartisan, because there's no rational reason not to do it. It is in fact less expensive than not doing it. That's the big difference. CNN: What are you plans for the future? Yates: Lots of plans. There's two major things. One is we feel like we're still at the very beginning of actually just getting the word out about what we do and what can be done. There are 118 million homes in the U.S. that aren't receiving our products and services or, eventually, there will be other companies like us providing those services. Secondly, there's a tremendous amount to be done with the development of our product. We have a lot of exciting products and product features that we will be rolling out in 2011 and beyond, and I can't speak to the details until we announce them, but I can say that what we look forward to is continuing to provide better and broader and deeper services to help people go from today, where there're totally -- pun intended -- in the dark about their home energy use to a world where ... what's the easiest solution. We can bring a 21st-century retail experience to the efficiency space. CNN: How does this relate to the federal "smart grid" project? Yates: We work with 45 utilities across the United States now in 20 different states. Ninety plus percent of them do not have smart meters. So, importantly, our products and services do not require smart meter installation. But we're thrilled about smart meters because smart meters give us tremendously more information to help provide customers new insights, and we excited to see them continue to expand across the country. Today it's something like 5 or 7% of homes have smart meters, and most of them are still in the process of going live -- so we're still at the very beginning of that. CNN: Aside from OPOWER, what else exciting is happening in green tech? Yates: There are so many clever ways to bring new products to the market that just do what we already want done but much more efficiently. An example is these new air conditioners that take advantage of the fact that there's all this excess electricity at night. The fact is that huge coal power plans and nuclear plants -- they take over a day to turn off and to turn on. So they can't turn off at night. They just run all the time, even though people aren't using much electricity at night. Most people don't know this. So there's a new couple of companies that use the energy at night to create ice and then they use the ice during the day to air-condition the building. I think that's super cool. CNN: Overall, it sounds like you're pretty optimistic about our ability to rein in energy usage. I wonder what guides your thinking. Yates: I think the jury is still out on whether we're going to get enough done in time. It's a matter of political will -- and political will is a nice way of saying it's a matter of our willingness to sign up to pay more for electricity. Because the technology is there, it's just expensive. And it's getting cheaper. The question will be will it get cheap enough, quickly enough.